My old, excellent shape 1903A3. Totally unrelated to concealed carry, but to still help drive the point home. I recently wrote up an article giving y'all some tips on how to be successful at a gun show. To go along with that, because a lot of the guns you'd find at the gun show are going to be used (though certainly not all the time) I figured I'd give you some tips on how to buy a used gun. Hopefully it goes without saying that the same applies to your local gun store, as well. But first, a short word on buying used guns off the internet. I've heard some real horror stories about folks buying used guns, and a lot of the time, these issues are compounded when you can't inspect the gun firsthand before you decide to make the purchase. And, therein lies the problem, right? You can't inspect it before you decide to buy it. 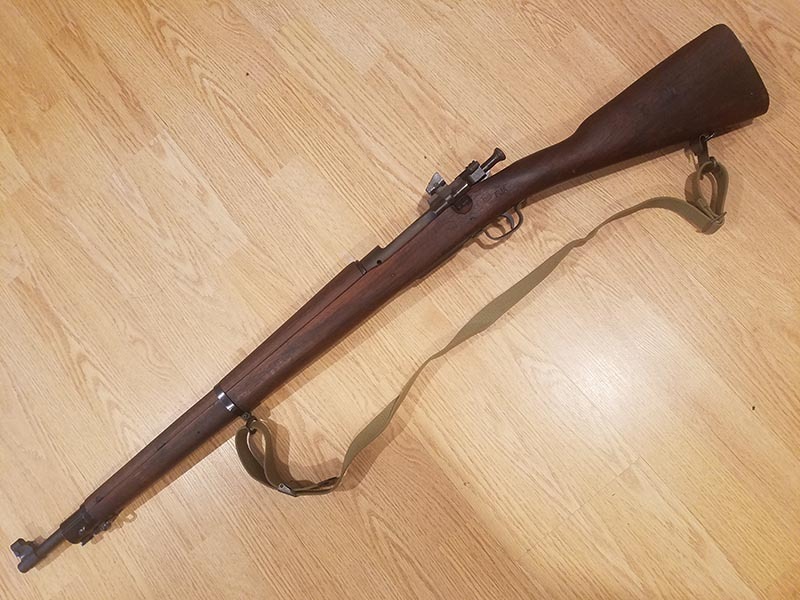 A good friend of mine decided he'd buy an old collectible WWII rifle that was supposedly a correct gun in decent shape (not the one pictured above, that baby is mine). He paid for what he thought the gun was worth, but when he got it, it was a totally different rifle than was in the picture. That's a huge problem, and last I heard he was fighting to get his money back. Here's the thing, unless it's a reputable place, and a new gun, I won't buy off the internet. If you decide to do it, be very careful because I know a few people who've been burned. Though, I do suspect that most of the people selling them are great people, there are always a few bad apples out there. In person sales are a totally different animal altogether. The main reason being that you can actually handle a gun before you decide to buy it. You can actually inspect the intricacies of the gun, make sure it seems to work, make sure the parts are there, and make sure you're not about to get ripped off. Here's the deal, I always function check a gun, and ask if it's okay if I disassemble it so I can take a good look–whether it's new or used. If it's a collectible, that's a different story, because some of them cannot be function checked. I want to make sure that I'm getting something decent, and that I'm not about to buy a turd. It's happened to people before, and I'm sure it'll happen again. If you know what you're doing, you can find a good deal on a great gun that still has a lot of use left on it. A moment ago I told you that you'd want to ask for permission to field strip the gun to inspect the components. Here's the deal, not everyone is going to let you do this. If they don't let you disassemble the gun, they should at least be willing to do it for you or they don't want to sell it bad enough. Think about why they wouldn't want to. There's either something wrong with it, or they don't trust you enough. Why wouldn't they trust you? A good friend of mine up north owns a gun shop and a guy came in browsing. He asked to see an old gun, I can't remember which one. He said he was a collector, and was flipping it around looking at it. When my friend went to go help someone else, the guy disassembled it and hadn't the foggiest idea how to put it back together again and was trying to put it together wrong, in a way that could've damaged the 1800s era firearm. My friend came back over and ripped the guy a new one. I felt he was a little harsh, but it did belong to him and the guy didn't ask for permission. From that point on, he never let anyone disassemble the guns. He'll do it for someone himself, though, because his goal in life is to actually sell his stock. So keep that in mind. If they don't at least disassemble the gun for you, walk away because they may be hiding something. So you should hopefully have a solid understanding of what the gun's parts are. One of the first parts to start to go is the barrel. I've actually bought a brand new pistol with pitting in the barrel before because I didn't know what I was doing. From that point on I've always inspected the barrel. Some folks will bring a bore light with them, But, just holding the barrel up close to a ceiling light (but not directly on it or all you'll see is blinding light) and looking through it is enough. If there are any fouling marks or other damage to the rifling, you're not getting a great deal because you'll likely have to buy a new barrel, anyway, and should just get a new gun unless the deal is that good. You can also look for general wear. Having a worn finish on the firearm isn't always a bad thing, but you have to assume that it's in trade for a reason. It could just be that the old owner was in need of a new gun. Or, it could be something more serious. Also don't assume that because a firearm is in 100% condition, finish wise, that it is so mechanically. It could just be that it's in great shape aesthetically because the previous owner had no clue how to shoot a gun. Maybe he damaged it in some other way. Never judge a book by its cover. Check the rest of the internals the best you can. Unless you know what you're looking for it may be hard to tell if it's in good shape or not. There will likely be some wear on some of the parts because it is used. But if everything looks/feels tight and goes well on the next step, it should be good to go. For good measure, I always pull the trigger again, just to make sure and to feel the trigger. In fact, I may do this several times after I've verified function, because a trigger is usually one of the first things people fiddle with. Did the prior owner modify their trigger? Did they do it themselves? Did they know what they were doing? If you don't know what it's supposed to feel like, it may be a good idea to pull out a new gun of similar make. If you're looking at a used Glock 19, ask the gun store owner to pull out a new one so you can feel its trigger. Compare them to each other. If it seems different and you cannot verify that the person knew what they were doing, it may be a good idea to walk. Asking for a few different things can help. First, ask if anyone has gone through the gun to make sure it's in legitimate condition. Who? A gunsmith is a good start. Listen, I know a decent amount about guns. After all, I was in the Marines, law enforcement, and have been working for the industry for a few years … but I'm no armorer, and I'm sure as heck not a gunsmith. You don't want to trust someone who doesn't really know. They should be qualified. What else? This is a stretch, but ask if there is any kind of warranty on the firearm in question. For example, if you get it home and it doesn't work, will they help you at all? They may not give you back your money, but maybe they'll fix it for you. Something is better than nothing. Just know that most stores will not do something like this but it can't hurt to ask. Have you ever bought a used firearm before? How was your experience? Let us know in the comments below.